furniture has always been in demand and timeless chairs styles such as farmhouse and high backed parson benches continue to remain in a class of their own. 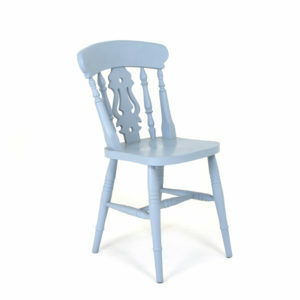 We can’t start talking about bespoke kitchen and dining room chairs without reflecting firstly, on the farmhouse style. Farmhouse is a way of life that reflects a love for the land and its bounty, and maintains a close connection between the two. 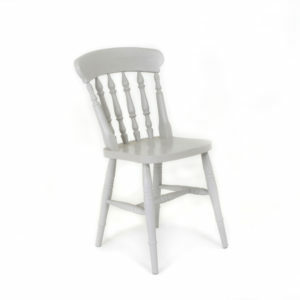 It’s no surprise that farmhouse chairs have gained such notoriety – beautifully designed and crafted objects in which to luxuriate but also to use within business. Design trends of the 00’s has taken interior designers to extreme lengths with the rise of industrial on one spectrum, to a huge focus on rustic and vintage elegance – once again bringing the farmhouse feel to the playing field. So back to the chair, an invention that’s been evolving continuously, but one that reclaims and holds its place. Only now it’s not enough to be comfortable, it has to be strong and suit a wide array of decors and personalities. A set of chairs can change the atmosphere and tells a story about the people who own them. 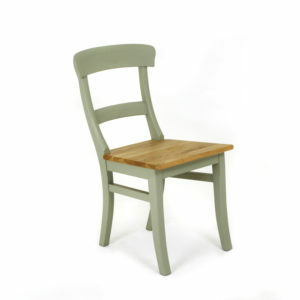 So as dining and kitchen chairs become the versatile hero of the home, we look at some of our favourite functional and stylish chairs that failed to go out of fashion, as quality and class still retain its desirability even in more austere times. Featuring elegant cabride legs and a solid oak seat, the Lincoln country chair boasts a classic look and carries itself as a variation on our popular ladder back chairs. The Lincoln chair serves as an unpretentious and very welcoming addition to any room, offering a great sense of style to farmhouse living. Based on Georgian designs from the 18th century, our Staffordshire ladder back chair offers intense practicality through the use of robust materials and quality workmanship. 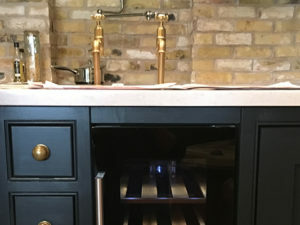 This has allowed the designs continual popularity in UK kitchens as one of the most endearing and simple interior design styles. The heart of the farmhouse style is the perception of the kitchen and the Mudd & Co spindle back chair provides the definition of country. Dating back to the 1940’s where the design takes its inspiration, the sculptural design, quality construction and scale of the chair lends itself to comfort and timelessness. Taking inspiration from more formal regency designs, the scroll back chair stands to attention with its feature back design. 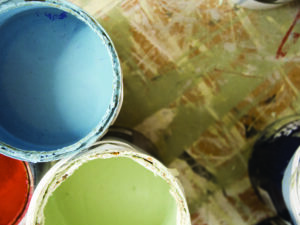 This design marries well with other decor styles too; traditional, modern, southern, cottage and even industrial. Each chair we have has a story to tell, just as each person is different, so to is every chair. 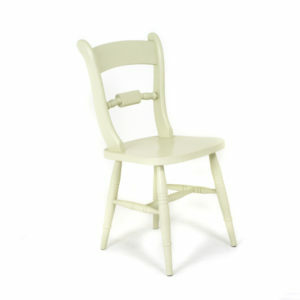 Why allow form to follow function when you can have both functionality and beauty in the form of the fiddle back chair. When it comes to dining chair design, there are a few iconic pieces that manage to exemplify these elusive two qualities and this design clearly does. 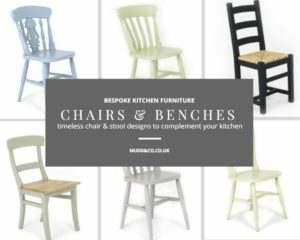 Our kitchen and dining room chairs provide inspiration and give the confidence to encourage customers to design their own bespoke table and chair sets to suit their needs. They stand the test of time and often have something unexpected about them. 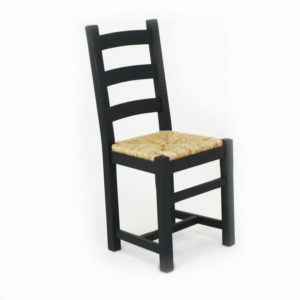 To speak to us about your own handcrafted bespoke kitchen chairs, call us on 01538 380 988 or visit our product pages to view our styles online. 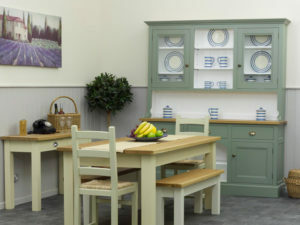 Add a splash of colour to your kitchen!